The Note Sleeve brings the hoarder and the minimalist together, all in an intuitive, thoughtful design. I’ve searched high and low for the perfect wallet for years. There has never been a better time to buy a wallet. 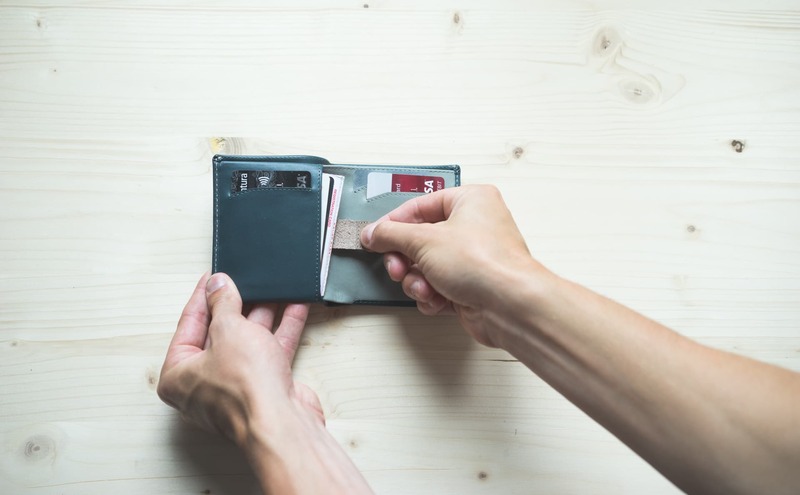 Between the many brands, styles, makes, and how easy the internet makes it to buy one, it’s possible for just about anyone to find the perfect wallet. I guess I wasn’t “just about anyone”. It started with the Dosh Aero money clip. The Aero holds six cards fairly easily and has a larger, international size to carry different sizes of currency. It’s super thin, super light, and very durable. 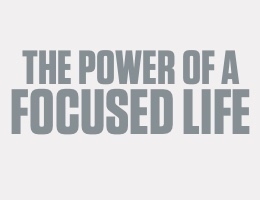 This is what I tend to carry on a daily basis. In the middle is my Bellroy Note Sleeve along with a little cash and a few coins. I also keep a Field Notes memo book inside a Hellbrand Leatherworks cover along with whatever pen I can find on my desk that morning. 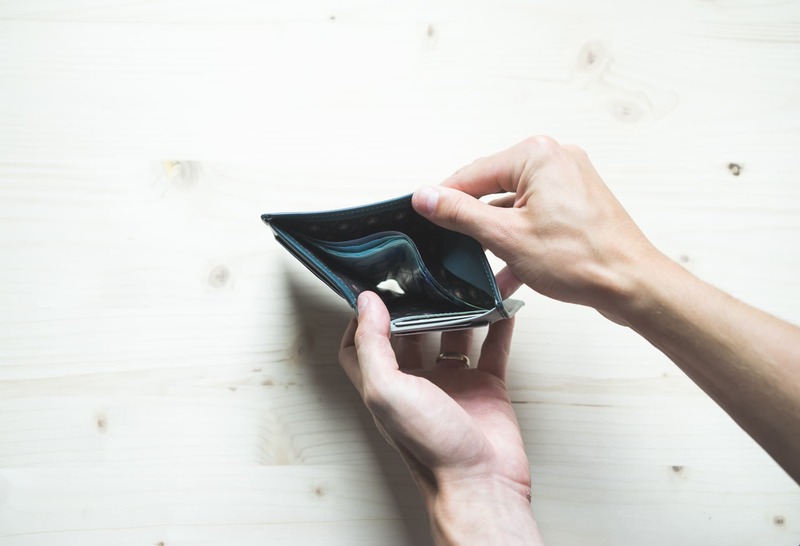 Inside my wallet, I need to carry two credit cards, a debit card, my drivers license, a gift card, and a few pieces of other identification in case of emergency. 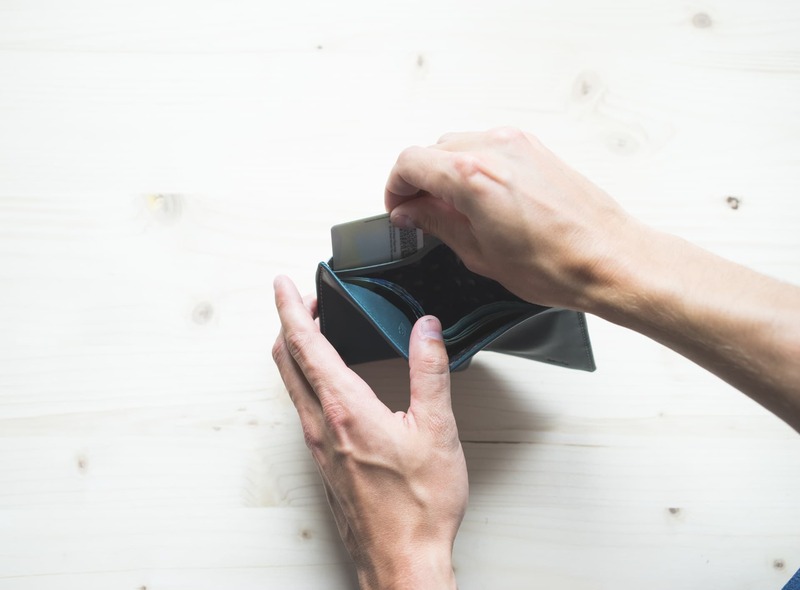 But Dosh’s offerings are a bit odd — they’re made of rubber and plastic, meaning absolute durability and construction, but also meaning a wide range of flexibility issues. Unless I have all six card slots filled, other cards fall out on their own. The hard plastic card slots leave little in the way of flexibility, but they are also prone to staining. The outside of my red Aero money clip is immaculate, but the inside looks like someone colored my wallet with a crayon. I’ve also used a simple leather wallet from Roots which offers more flexibility and less card loss. 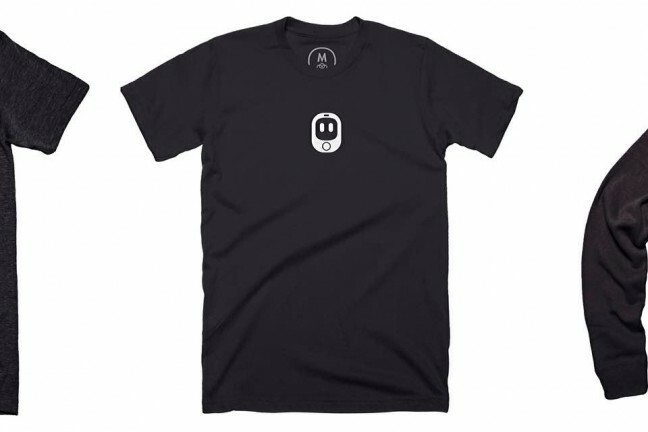 It’s simple, cheap, and can be found at just about any Roots store here in Canada. 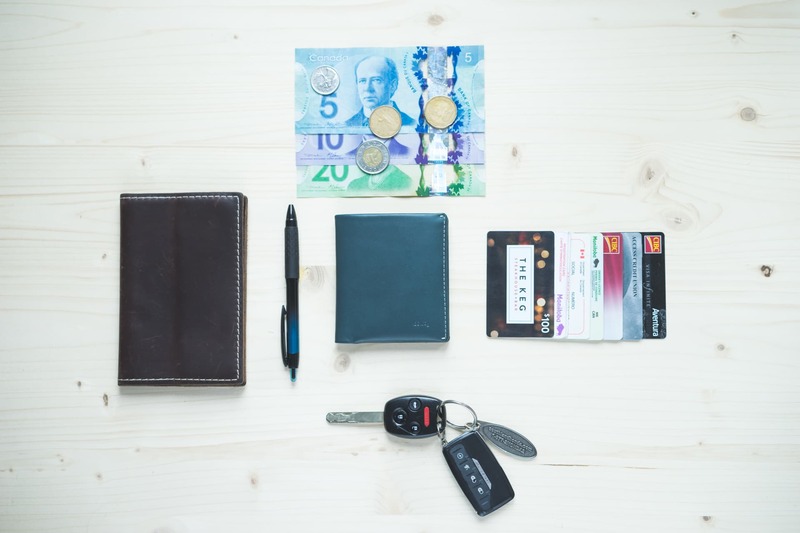 Unfortunately, the Roots wallet is designed to carry everything: credit cards, gift cards, currency (although, only American or Canadian currency; different sized international currencies always stick out of the top of the wallet), drivers licenses, health cards — you name it, the simple Roots wallet can carry it. It has no less than 14 dedicated card slots and 2 currency sleeves for separating currency and receipts when on the town. 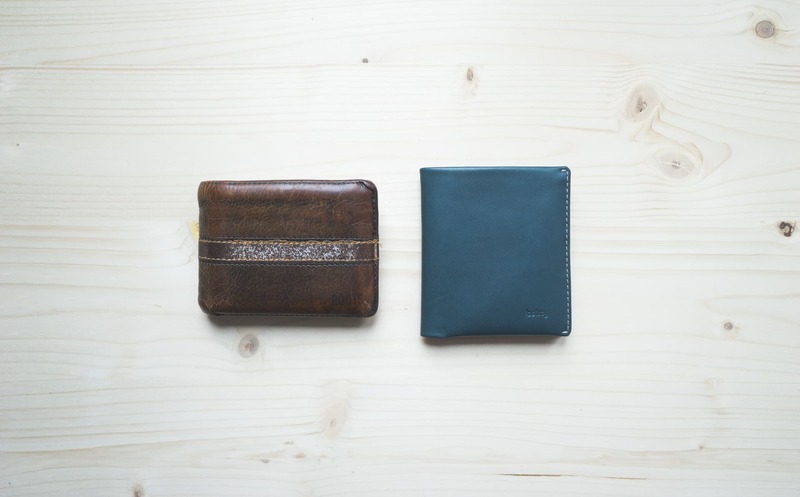 The Dosh Aero and the Roots wallet are on opposite ends of the spectrum. The Aero is a simple, minimal money clip designed to carry less, while the Roots is designed to carry everything. 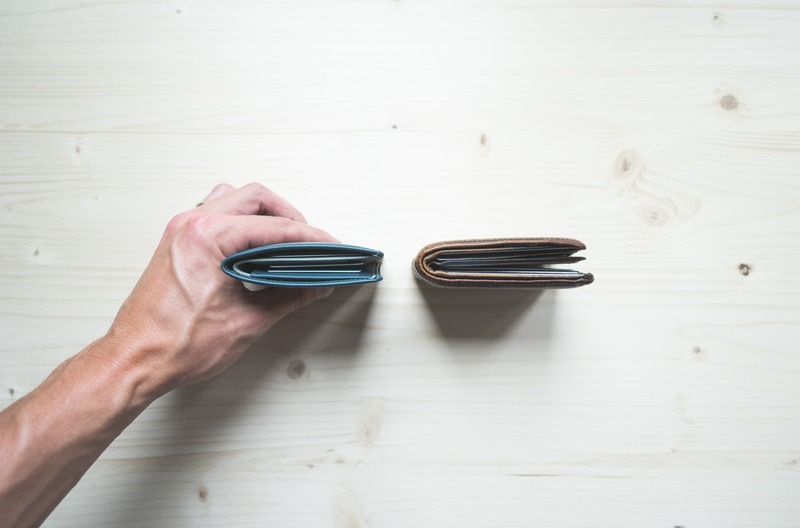 I’ve flipped back and forth between the wallets for years, all the while keeping my eye out for a wallet that could carry everything while still remaining thin and small. The Bellroy Note Sleeve is the middle road between my two prior wallets and between the two generic wallet designs on the market. Bellroy has long boasted about its ability to shave centimetres off your wallet just by redesigning the shape and the layout of its products. They even designed a nifty graphic to show how you can turn your Costanza-esque wallet into a thin, minimal carry. I always looked at this graphic with skepticism, as I’ve never seen anyone carry a thick wallet like the one shown. That said, it’s still very clear Bellroy’s wallets are thinner and better designed than the standard bi-fold wallet design. It’s not like the Bellroy Note Sleeve recently came out and found a way to magically fix all my wallet woes. The Note Sleeve has been around for a few years already, and I’ll admit to researching it endlessly for over a year. I wasn’t sold on the look from the get go, and I was especially not in love with Bellroy’s color combinations. I kept pushing off a purchase, thinking I’d find something better. Between getting tired of looking and Bellroy introducing a few new colorways, I was pushed over the edge. I picked up a Bellroy Note Sleeve in the teal colorway and I’ve been pretty happy ever since. The wallet finds a way to meet both ends of the spectrum in the middle, but it’s not without its quirks. One of the very first reviews I wrote for Tools & Toys was of the Hellbrand Leatherworks Field Notes cover. I remember opening the Hellbrand’s packaging and pulling out the thick and luscious leather cover and sitting in awe at how it felt in my hand. I use that Hellbrand cover to this day, never being ashamed to pull it out of my back pocket despite all the buffs and scrapes on its beautiful leather face. The Hellbrand Leatherworks Field Notes cover on the left has the highest quality of leather I’ve ever laid my hands on. It has spoiled my tastes and set the bar extremely high for the Note Sleeve. The Hellbrand cover absolutely blew any prior leather product I had felt out of the water. It set a new bar for leather quality. And it set that bar so high, I found constant disappointment when searching for a wallet. The Note Sleeve was a casualty of the Hellbrand cover. I had played with Bellroy’s Slim Sleeve, High Line, and Low Down at a local shop on numerous occasions, and I always left the store wondering why the leather felt so poor compared to the Hellbrand. As time passed, I began to realize the rarity of the Hellbrand’s leather quality. It’s so good that it’s actually an outlier. Which not only made the playing field unfair for wallet makers, but also made me unfairly assume anything poorer than the Hellbrand was poor in and of itself. This is completely wrong. It’s within this light that I look at the Note Sleeve. The Note Sleeve’s leather is soft and supple, although slightly more synthetic than those niche leather products you find on Etsy. The leather smells great as well, which is slowly becoming a checkbox on my list of must-haves. More importantly, the leather isn’t too thick to be too heavy and too large in your pocket, and it isn’t too thin to make tearing an issue. As mentioned at the top, the Bellroy Note Sleeve’s leather finds a way to balance the spectrum right in the middle. The Note Sleeve is made of a premium vegetable tanned leather, meaning it can come in a variety of colorways. You’re looking at the teal colorway, which comes with white stitching, a grey interior leather color, and a beige/light brown pull tab. I really like the burnt orange and aqua blue colorways as well. I can’t feel a difference between the different colored leathers, but I have noticed scrapes showing up more clearly on the grey leather than on the teal leather. This is a bit of a louder colorway, but I appreciate the understated character the color brings to my everyday carry. As a whole, I’m not sitting here in utter awe at the Note Sleeve’s leather quality. But I’m far from being disappointed. Instead, what’s more clear is how the thickness of the leather plays into the Note Sleeve’s overall build and design. 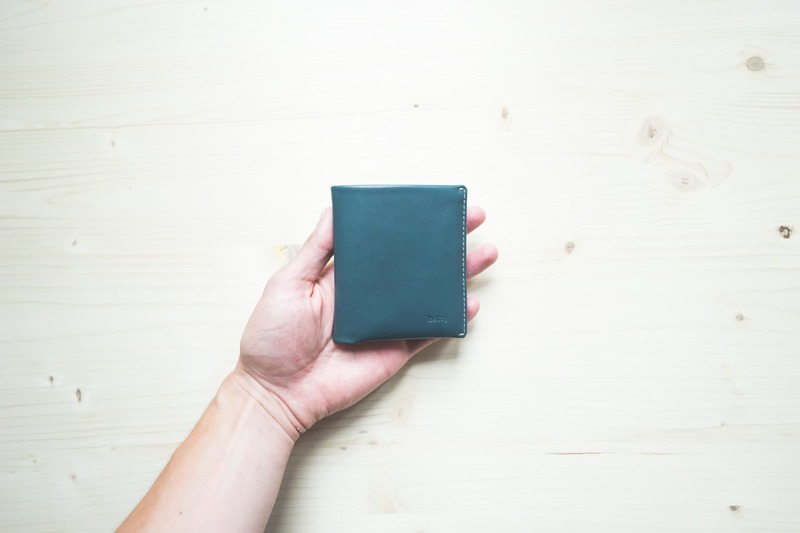 If Bellroy used a thicker leather, this wallet wouldn’t be capable of meeting both ends of the spectrum in the middle. Bellroy’s bread and butter is in how its wallets are laid out, how the leather pieces fit together, and how you access your carry essentials. Just looking at the Note Sleeve next to a standard bi-fold design points out how Bellroy has slimmed down their wallet. I’m pinching the Note Sleeve in the above photo solely to give a better idea of thickness. My Note Sleeve is still relatively new, so the leather hasn’t entirely broken in just yet. The first step to eliminating thickness is by eliminating leather, naturally. Bellroy uses less leather in its wallet designs than standard bi-fold designs, which quickly reduces thickness and weight. 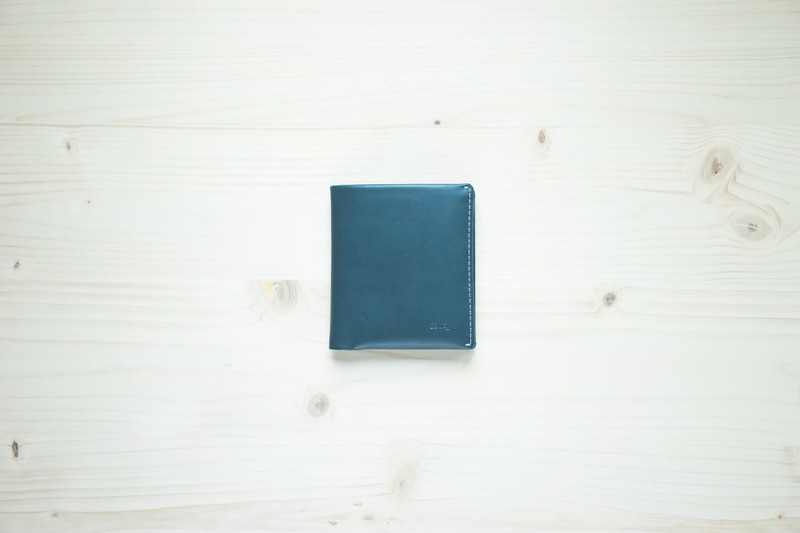 This is especially noticeable when comparing an empty traditional bi-fold wallet and an empty Note Sleeve; the Note Sleeve, even though it can carry the same amount of essentials, feels considerably thinner and lighter out of the box. The lack of superfluous leather is essential to Bellroy’s thin and light designs. It’s very easy to see how Bellroy has adapted the size and shape of the Note Sleeve. It’s more square and tall than standard bi-fold designs. The Note Sleeve is designed to carry your credit, debit, and gift cards vertically instead of horizontally. This makes the entire wallet less wide and more tall. 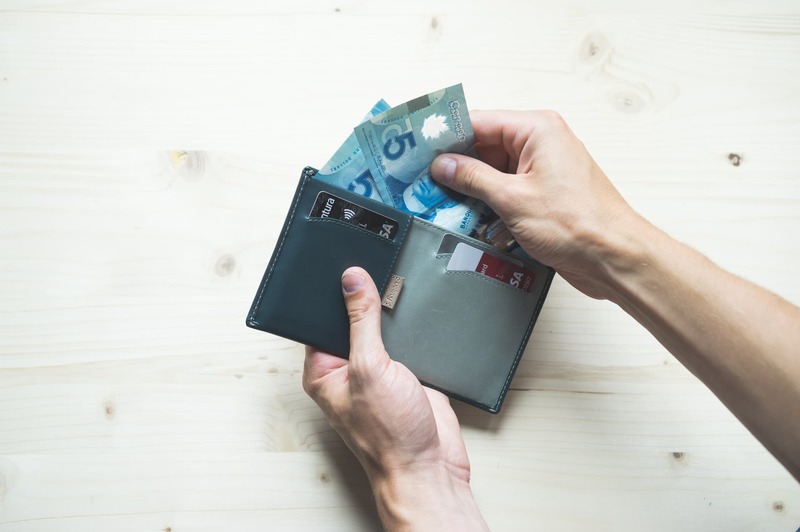 The added vertical height gives the Note Sleeve extra space for carrying larger international currencies, and the lesser horizontal width makes for a more squared-off bi-fold wallet. It’d be hard to measure whether the Note Sleeve has a lesser footprint because of this design decision, but I do notice a more comfortable shape in my front pocket. The taller, narrower design is thanks to the vertical card slots. Standard bi-folds have horizontal slots, while the Note Sleeve incorporates the thinner, taller slot. 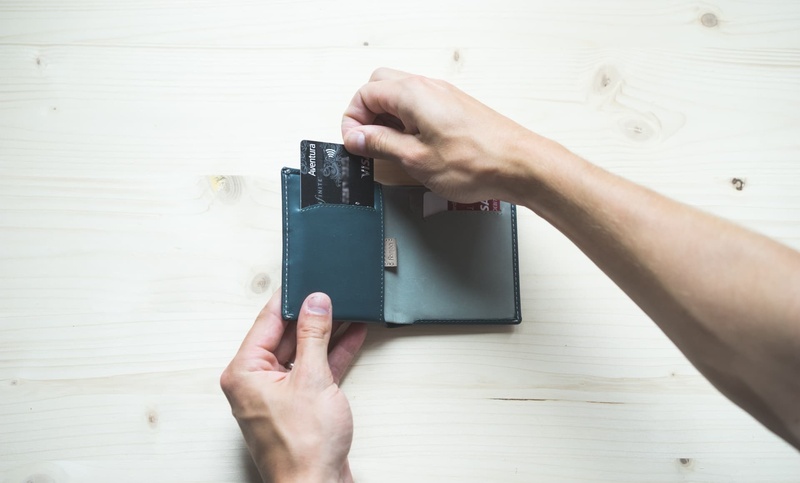 Inside, you’ll find three immediate card slots for your most used cards, a currency slot at the top, a pull-tab for storing all your less-used cards, a fourth card slot hidden in the currency slot, and a small flap of leather covering a small coin pocket in the currency slot. There’s a lot packed inside, and how you organize your cards will play a role in how the wallet feels in your pocket. Looking from the top, you can see how cards are spread out in the Note Sleeve. The pull tab and main card slot is on the bottom half seen in this photo, while the two card slots, hidden slot in the currency slot, and coin pocket are all in the top half. The three immediate card slots and the fourth hidden slot are meant to be filled before filling the pull tab with your extra cards. Looking at the Note Sleeve from the top proves this point: If you were to put your extra cards in the pull tab and leave one of the slots empty, you’d be overloading one side of the Note Sleeve. Perhaps this is obvious, but I found my Note Sleeve wouldn’t close when I first filled it up. After realizing I had an extra card slot on the right half of the wallet, I was able to more evenly spread the thickness of my cards, and this helped the Note Sleeve sit flat on the table. The pull tab is an ingenious way of keeping a stack of less-used cards hidden away and easily accessible when needed. Once your four card slots are filled, anything extra can be put into the pull tab slot. This pull tab is ingenious — it’s the one thing everyone says “Wow” about when I show off how the wallet is designed. You can load up this slot with all your leftover, less-used cards, and pulling them out of the slot is as easy as pulling the tab. The cards fan out from the slot, and choosing your card is a piece of cake. Pushing the cards back into the slot is as easy as loading the slot in the first place. I can’t see there ever being a delay at the till if the card you need is in the pull tab slot. 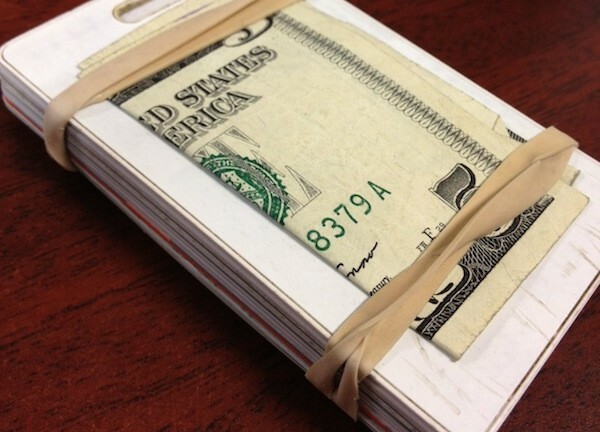 Cash fits snugly inside the Note Sleeve and takes a little more time to slide in properly. Wider bi-fold designs are more flexible and provide more space for quickly stashing cash in your wallet. The Note Sleeve’s narrower design means cash of all sizes fit like a glove. Again, because of the less-wide-more-tall design, the currency sleeve can easily accommodate different sized currencies. However, the downside to this shape is how difficult it is to quickly slide currency into the wallet. 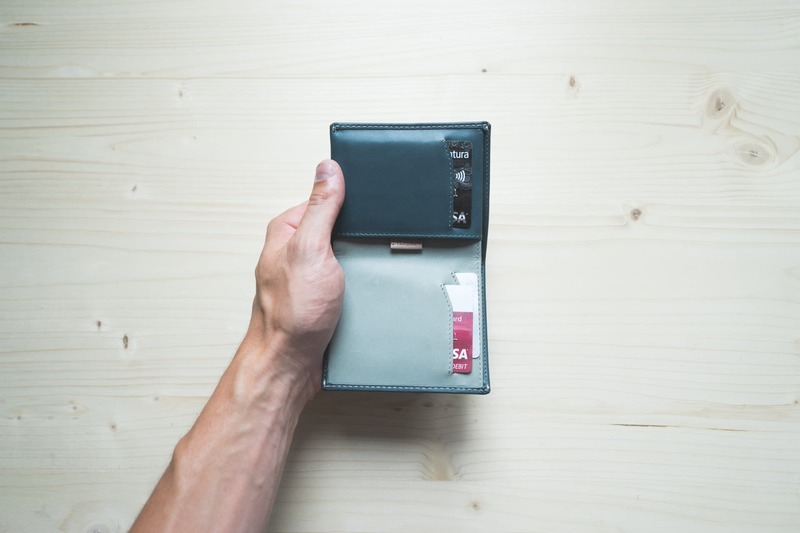 With a larger horizontal on standard bi-fold wallets, there’s extra room to spare on the ends, allowing for more flexibility when sliding currency inside. The Note Sleeve’s shape and design forces you to more properly aim where you are inserting your currency. I had to carry a large stash of cash recently (Don’t worry, it wasn’t my cash!) and the Note Sleeve didn’t handle a large amount of cash very well. The wallet tends to stay open, especially with the less flexible Canadian polymer bank notes. 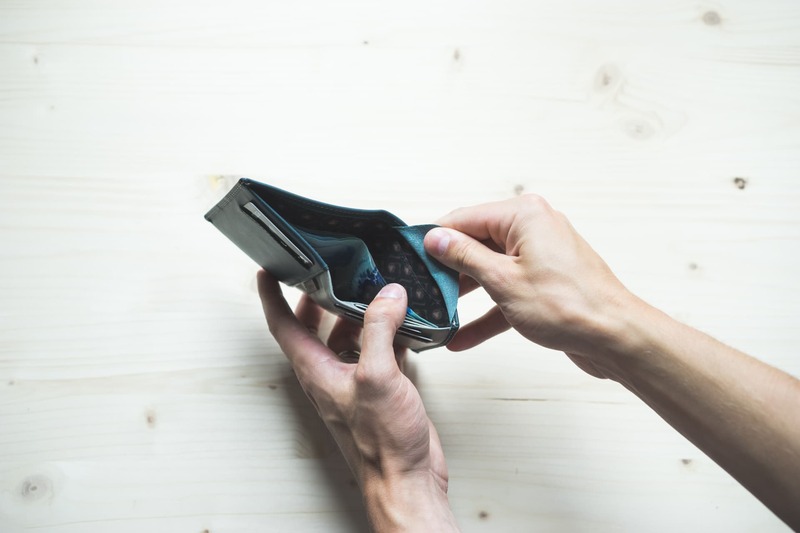 I tend to carry less cash on a daily basis, so I don’t run into this problem too often, but those who carry lots of cash might find this to be an annoyance. The Note Sleeve doesn’t handle large amounts of currency very well, and this may be of more interest to my American friends. I recently had to carry a multitude of $5 bills in the Note Sleeve, and I was disappointed in how quickly currency caused the Note Sleeve to fill up. Fully loading the Note Sleeve caused it to sit wide open on the table and it became much more noticeable in my jeans pocket. I imagine cash carriers who have large amounts of $1 USD bills in their wallets would find this to be a bit of a nuisance. I rarely carry that amount of cash in my wallet, but my Dosh Aero money clip handled that amount of cash with absolute ease. There is a small flap of leather on the right side that hides a coin pocket or a slot for keeping smaller business cards. Lastly, slightly hidden on the right side of the Note Sleeve is a small slot for carrying coins or other cards you need to keep in tip-top shape. I’m impressed with Bellroy’s ability to sneak a coin pouch into the Note Sleeve without making it unbearably thick. 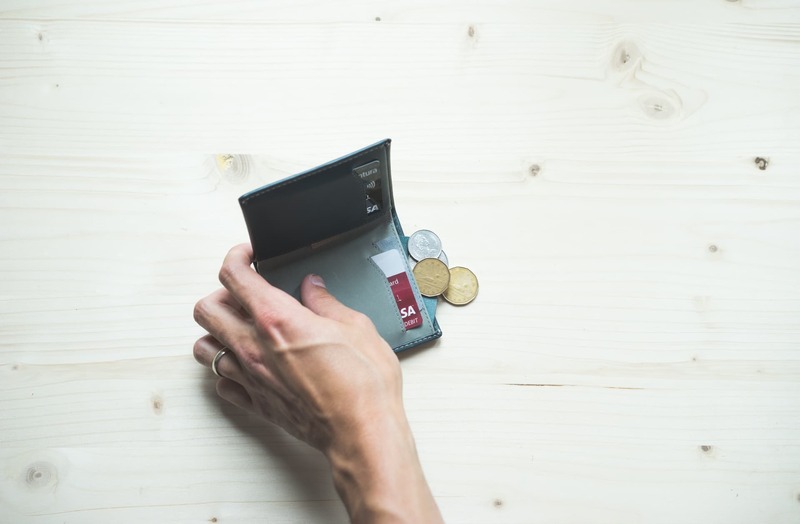 Putting coins into the little pocket is more difficult than lifting the flap and pouring them out, but it’s a viable alternative to carrying coins freely in your pocket. A few coins fit nicely in this pocket and don’t make the Note Sleeve too thick in your pants pocket. However, I do find smaller coins to get caught in the corners of the coin pocket, making them very difficult to get out. The only downside to the coin pocket is when small coins find their way into the tighter corners of the wallet. I first put a few loonies and toonies ($1 and $2 Canadian coins, respectively) into the coin pocket and removed them with ease. However, after putting in a few dimes and nickels, I found the smaller dimes would get caught in the corners and would be harder to pull out. I tend to leave this coin pocket for larger coins only, and if I’m only carrying a few coins, I simply keep them lose in my pocket instead. As you can see, there are a few specific design decisions which work to eliminate wallet thickness and to improve the footprint in your pocket. The Note Sleeve takes this a step further by providing a pocket for carrying small amounts of coin. Thanks to Bellroy’s design, the Note Sleeve largely succeeds at doing everything, all at once. The Note Sleeve is the first wallet that allows me to carry everything I need each day, without being overly large and uncomfortable. Manitoba health cards, for instance, are inordinate shaped and are necessary in case of an emergency. That health card never properly fit in my prior wallets and I’m thankful to have it on me in case its information is necessary. The Note Sleeve can carry international currency painlessly. Does this change things for me each day? No. But I’m glad to know I don’t need to go looking for a different sized wallet the next time we fly over the ocean. The Note Sleeve’s coin pocket is good for carrying smaller business cards which need to be kept in proper shape, or for carrying spare SD cards for your camera. I gravitate toward the latter option, often preferring to keep a backup in my wallet just in case. I use the less apparent card slot to hide my drivers license. It’s extremely accessible if need be, but a little less obvious than being the first card you see. The hidden card slot in the currency slot is perfect for a drivers license. 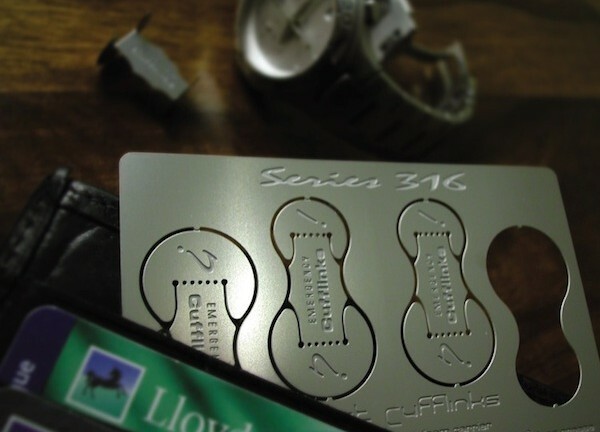 The slot is relatively hidden, but is perfect for quick access if you are asked for your identification. The Note Sleeve, like all Bellroy offerings, has very little branding. There is a simple stamped Bellroy logo up front and another logo stamped into the pull tab. Although I chose a more funky colorway, I’m glad the branding is subdued. I often pull out the Note Sleeve and hold the wallet in this manner, with the card slots facing horizontally. You can also see here how the card slots on the right (or bottom, in the case of this photo) are positioned fairly high up towards the top of the wallet. It’s an asymmetrical look which kind of bugs me. I prefer to hold the Note Sleeve vertically (so it flips upward) and then slide cards out towards the right. The wallet fits nicely in my palm and feels quite natural to use in this manner. The two card slots on the right half of the Note Sleeve are positioned very closely to the very top of the wallet. The top of my second credit card actually touches the stitching at the top of the leather. Not only does it look odd and asymmetrical, I’ve found the two cards on the right side to slide out a little ways on occasion. If you shake the wallet hard, they can even fall out. The spine of the Note Sleeve has a hole where the normal bi-fold wallet design does not. This means extra coins or small trinkets (like, say, a spare SIM card) can’t be kept in the currency slot without falling out in the middle. The wallet quickly conforms to the shape you keep it in in your pocket. It also conforms to the shape of what is kept inside. If you keep coins in the coin pocket and sit on your wallet for a long road trip, that coin circle will be stamped into that leather for a while to come. These are just a few observations I’ve had in my time with the Note Sleeve. I greatly appreciate how it has brought together the thin, light, minimal Dosh Aero money clip and the thicker, heavier, Costanza-like Roots wallet to create a very successful middle-of-the-road. Wallets are different things to different people. Some people have an intense pride in bringing along only that which they absolutely need, and not a penny more. Others hoard every receipt and gift card they come across, only to throw them out upon an annual cleansing. 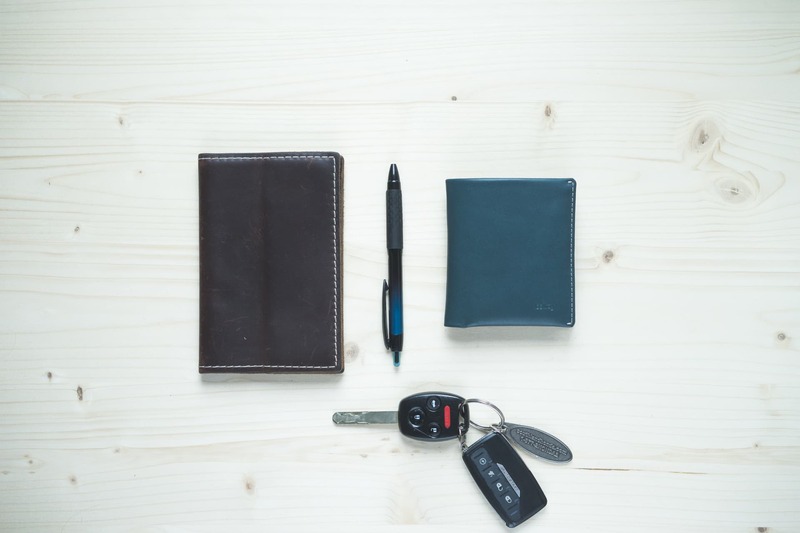 Bellroy’s Note Sleeve comes in at $90 USD ($110 CDN) and fits right in between the standard bi-fold design and thinner, lighter money clips or slim wallets. It’s not without its quirks, but this is a fine option for those who need a little bit of hoarding and a little bit of minimalism. I find myself largely in between those two needs. I don’t care to carry five different reloadable gift cards if I know I won’t be visiting said store during the day, yet I need a place to stash a few receipts if necessary and I certainly want to have my medical cards on hand if an emergency arises. Further, cash is still king, and our polymer Canadian bills don’t fold all that well. In my mind, this largely eliminates the opportunity to use any of Bellroy’s super slim options, even though those designs are equally as impressive. On top of all this, the Bellroy Note Sleeve is a relatively affordable option. I remember raising an eyebrow the first time I saw the $90 USD ($110 CDN) price tag, but it’s amazing how hard it is to find a high quality leather product for less than that these days. 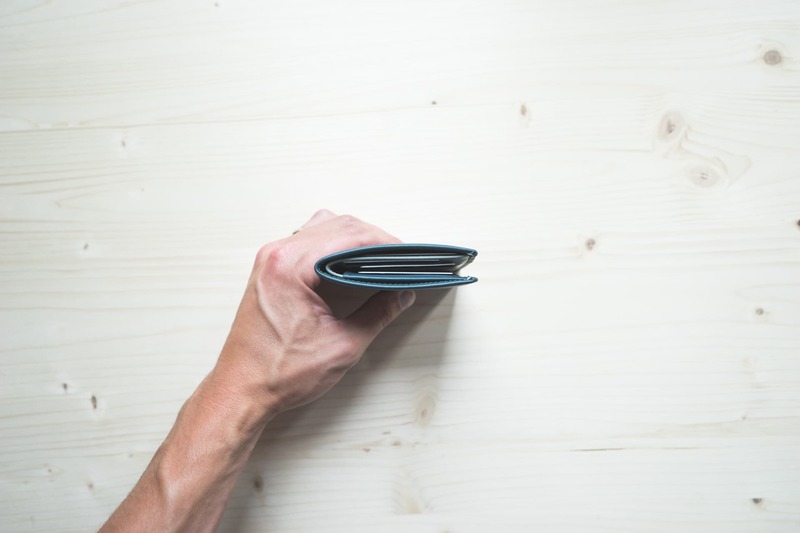 If you want a leather wallet to last you at least five to ten years, you’re going to spend $100 no matter what. Considering the design process, the innovations within, and the fact you’ll use this wallet every single day, that $90 price tag becomes far easier to swallow.